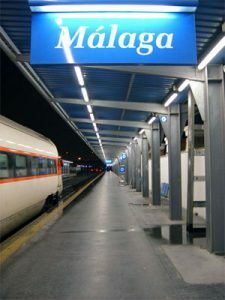 Communications with the Costa del Sol improved with the entry into service of the rail line linking Malaga and Fuengirola, in the summer of 1975. On August 1st, the railway was launched with 70 trains daily, with a frequency of every half an hour and about 50,000 seats in total. The convoys stopped at seven stations: Málaga, San Andres, Golf Camp Golf-Benítez, Torremolinos, Arroyo de la Miel, Los Boliches and Fuengirola. The line consisted of 31 kilometers. Of the seven stations, three were underground stations (Malaga, Torremolinos and Fuengirola). The train, which made its way in a little over forty minutes, was working from six in the morning until eleven at night. The prices were set ranged between 13 and 33 Pesetas for single trips and between 20 and 58 Pesetas for a return ticket during the same day.